We know that overall health is linked to oral health so it is extremely important to ensure your preventative care routine is thorough and is keeping your teeth and gums healthy. And this all starts at home. We recommend brushing twice a day for two minutes with an electric toothbrush and flossing every night. When you have calculus (tartar) build up on your teeth it is just about impossible to remove at home with your tooth brush. This is why it is so important to see us here at Gentle Dental Hawthorn every 6 months to remove this calculus which will lead to gum disease with our gentle cleaning so that you can have the healthiest teeth and gums possible. At Gentle Dental Hawthorn we perform an oral cancer check during every examination. We analyse your mouth and throat to observe any changes. A systematic examination reduces the chance of any lesions being missed. The goal of root canal treatment is to save your natural tooth. If you have an infection, abscess or there has been damage to the pulp of your tooth the only two options are either root canal treatment or to remove the tooth. Any treatment dentists complete has a life span and as such we believe it is very important to try to save your natural teeth for as long as possible. Before we commence root canal treatment, we will carry out a thorough examination and give you all of the options. Your comfort is our priority and our goal is to be the most gentle dentist in Melbourne. The entire area will be numb before we commence root canal treatment. You will also have rubber dam over the tooth to keep the area sterile, dry and protected. 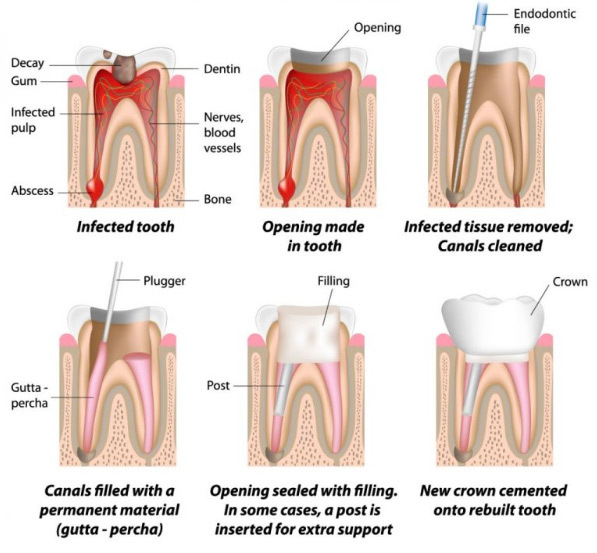 The process entails removing any decay the tooth may have, removing the infected nerve inside the tooth, shaping and sterilising the canals inside the tooth and then filling these canals. The tooth may discolour. If this occurs, we can discuss internal bleaching with you. The tooth may also be quite brittle after it has had root canal treatment so it may be necessary to place a crown over the tooth to protect it. If you would like to make an appointment please call us on (03) 9818 2994 or book online. Sometimes it may be necessary to remove the wisdom teeth. There are many reasons for this including: lack of space, decay or gum disease, pain or infection. Some wisdom teeth are very straight forward to remove. If this is the case, we will be able to remove your wisdom teeth at Gentle Dental Hawthorn. However, in some circumstances, wisdom teeth removal may be more complicated and we will refer you to see an Oral Surgeon. During your initial consultation we will refer you for a full mouth radiograph to assess the likelihood that your wisdom teeth will cause issues in the future. Please call us on (03) 9818 2994 to book a consultation or please make an appointment online. Amalgam is the traditional silver filling material used in dentistry for the past 150 years. Due to its silver colour, it is not as aesthetically pleasing as other restorative materials we have, including composite resin. As it is composed of metal it expands with heat and contracts with cold, and can lead to cracked tooth syndrome. Amalgam also requires removal of more tooth structure than composite resin as it requires mechanical retention to stay in place. Here at Gentle Dental Hawthorn we are focussed on your health and we will only remove amalgam with rubber dam in place, with high volume suction to safely remove all waste products. If you have any questions please call us on (03) 9818 2994 or book an appointment online. Composite resin is an excellent alternative to amalgam as it is available in many shades to match your tooth colour and we are able to remove less tooth structure as the material bonds micro-mechanically to your tooth. The disadvantage of composite resin is that it is not as strong and may not last as long which is why sometimes teeth require porcelain crowns, inlays and onlays. If you have any questions or would like to book an appointment please call us on (03) 9818 2994 or book and appointment online.